Serve these delicious sweets on an attractive serving tray or on a festive holiday plate. Great for parties, during the holiday season, or any time! In a medium bowl combine crushed wafers, ground almonds, 3/4 cup confectioners' sugar, and cinnamon. Blend in melted chocolate chips, pumpkin, and coffee liqueur (or apple juice, if using). Shape into 1/2 inch diameter balls. 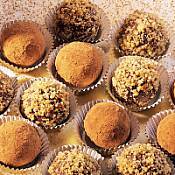 Roll the truffles in confectioners' sugar, cocoa powder, or ground almonds. Place truffles in pretty candy cups. These are so good. I made them for a dessert contest at work and won hands down. I split the recipe and made a batch with the coffee liquor and with apple juice, but I think they taste the same. If you are thinking of trying this recipe don't hesitate. It is great. We had these today at my Christmas Party. Everyone wanted the recipe. Of course, I said I got it on DianasDesserts.com. Love them. Thanks, Joann, Farmers Branch, Tx.